You can format your lat/long labels (contour, axis, post, etc.) in degrees, minutes, seconds (DMS) format in the Label Format options. Expand the Label Format section in the Properties window on the Labels page under the Labels section. 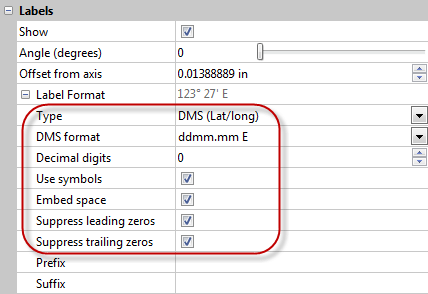 Change the DMS format to the specific lat/long format you wish to display. Select any other options you wish, such as setting the number of decimal digits, displaying symbols (° ' "), embedding spaces, or suppressing leading or trailing zeros.